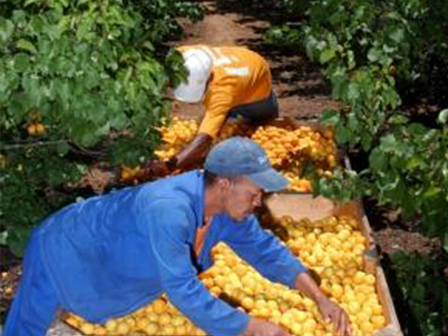 Farming activities at Randrivier are quite diverse and labor intensive and it is necessary to spread the work load over the year and utilise the available workforce as good as possible. We produce grapes for winemaking, which we deliver to Rodezandt Co-op, peaches and apricots for the canning industry, and Stone fruit and Citrus for the export and local fresh markets. 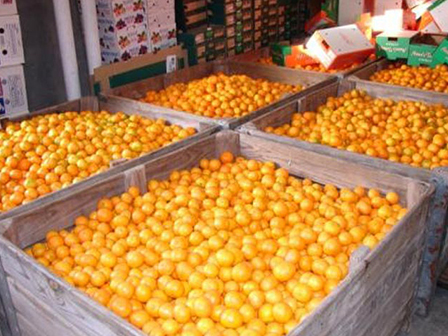 We start harvesting in November with Nectarines and end July with Lemons. 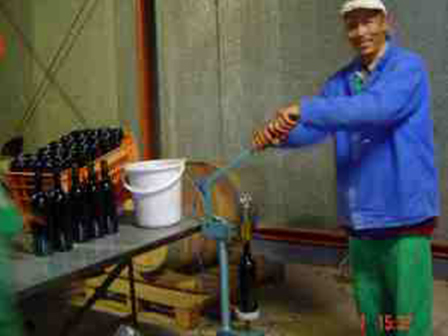 7ha (Opstal) The guesthouse, pack house and work shops are on this main farm from where all operations are controlled. 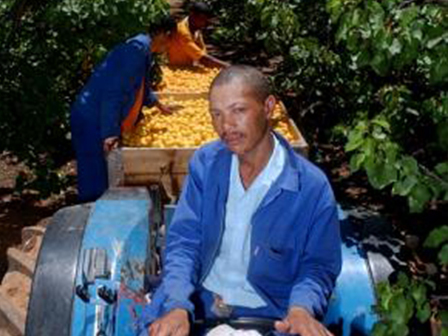 On this farm the production of plums and grapes as well as the sorting and packing of all the other farms’ fruit are being done. 6 ha (Oorkant) The Willemnels river is running through this piece of land and the production of wine grapes and peaches for the canning industry takes place there. You will also find a historical stone bridge over the water canal and siphon where the canal crosses the river. 3,5ha ( Vark kamp) This one is next to the R62 and all the laborers cottages are there, also the production of plums are taking place there. 15ha (In die Bos). This farm is next to the golf course and is used for the production of wine grapes, plums, peaches, nectarines and apricots. There is a farm dam where fishing can be done if you bring your own tackle. 34Ha (Die Eiland). This farm is in the basin of the Breëde river and there are plenty water streams and fish and bird life. Citrus and Red wine grapes are being produced on this farm. As you have to cross the flood plains of the Breëde river on this land you will need a car or van with high ground clearance. Drive carefully or you will have to park your car at the entrance and have a walk into the area. There is a bridge that takes you over a stream on to the Ram Island. Be aware of the possibility to spot some snakes like Cape Cobra and Puff adder. For fishing bring your own tackle. Every one exploring and taking part in activities on Randriviers farms is doing so on their own risk. 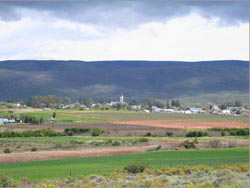 Robertson, our is a town in a beautiful setting in the shadows of the Langeberg Mountains in the Breëde river valley. 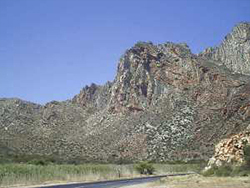 Robertson is the main town in the Robertson wine Valley with its numerous tourism attractions and neighbouring towns of McGregor, Ashton, Bonnievale and Montagu. It is central located and been use by tourists for the town to stay in while they explore the area in a 160 km radius. We want you to enjoy your stay in our valley and experience as much as possible! 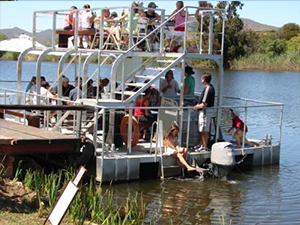 Join the idyllic Breede River Boat trip They offer safe swimming from the The River Goose, Bass fishing, bird watching and along an exceptionally beautiful section of the river. 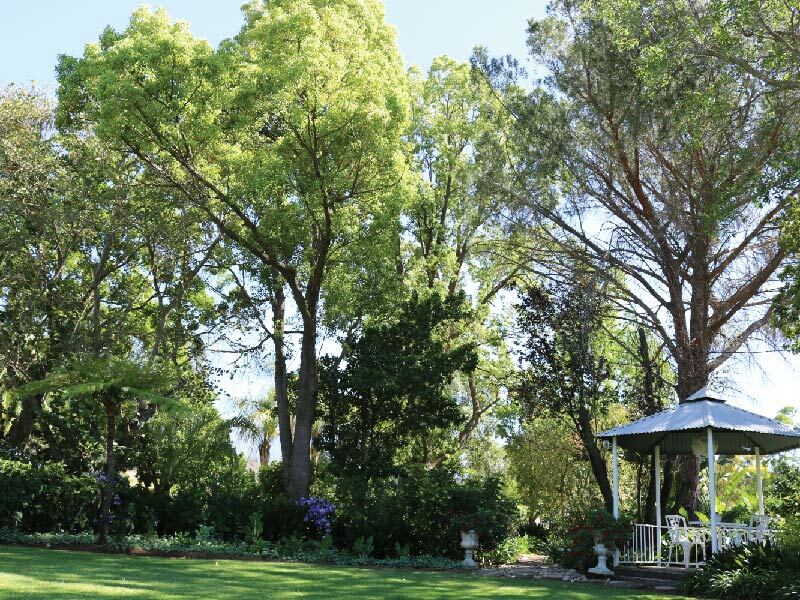 Bring own refreshments or combine the trip with riverside braai under the giant blue gum trees. 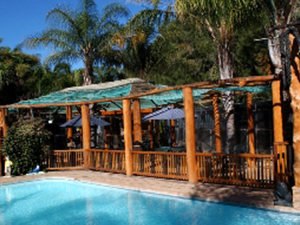 Enjoy a peaceful 2 hour boat cruise on the Breede River while you feast on a delicious 3 -4 course meal of “boere kos”. brunch, lunch, sundowners & dinner on the boat. Solo or tandem jump available on request. Discover your sense of smell at the Tourism Office with all Kind of fruity flavours ect. An olive tree has been planted in memory of those who have been taken by the aids pandemic. 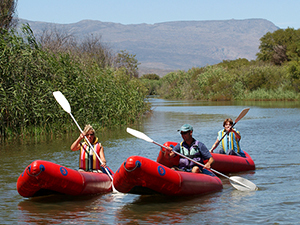 Enjoy a day of fun on the Breede River with guide and lunch included. Excellent bird viewing and mountain views. Open Mon – Sat . Various artists work on display. A little Mexico in Africa. 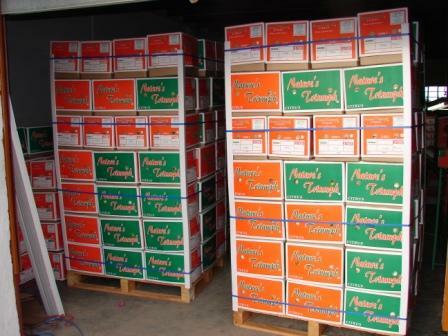 More than 2000 varieties of cactus and aloes. 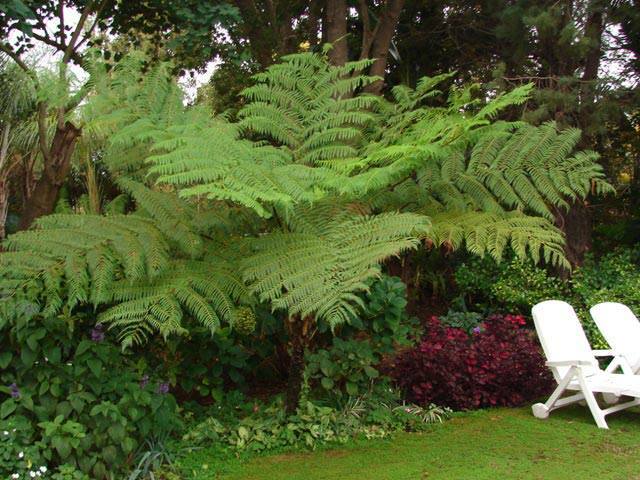 A must for any plant lover. Bookings essential for large groups. 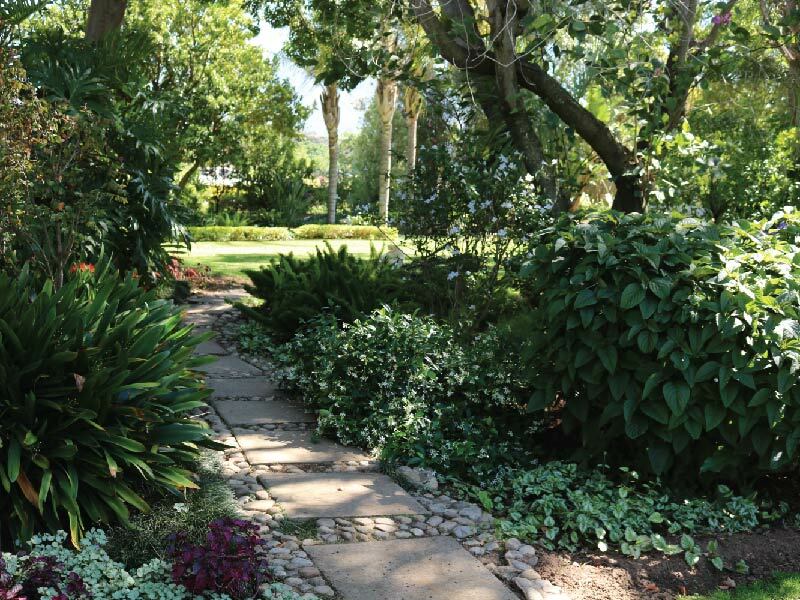 A portrait of the spiritual diversity of South Africa in mazes, labyrinth, trails and succulent gardens. Larges Maze in the World. Lots of stories, very educational. A centre for abused , neglected and elderly donkey’s. The Donkey sanctuary is committed to preventing cruelty and relieving the suffering of donkey’s. It has a lovely restaurant named Esseljiesrus it is on your way to McGregor. 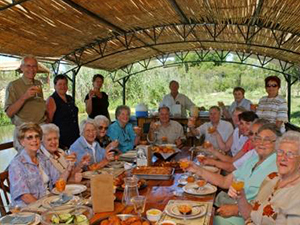 An Olive culture experience tasting is not to be missed in the beautiful little town of McGregor. Olive tours on the farm. Advance bookings are essential. Summer is the time for picnics! 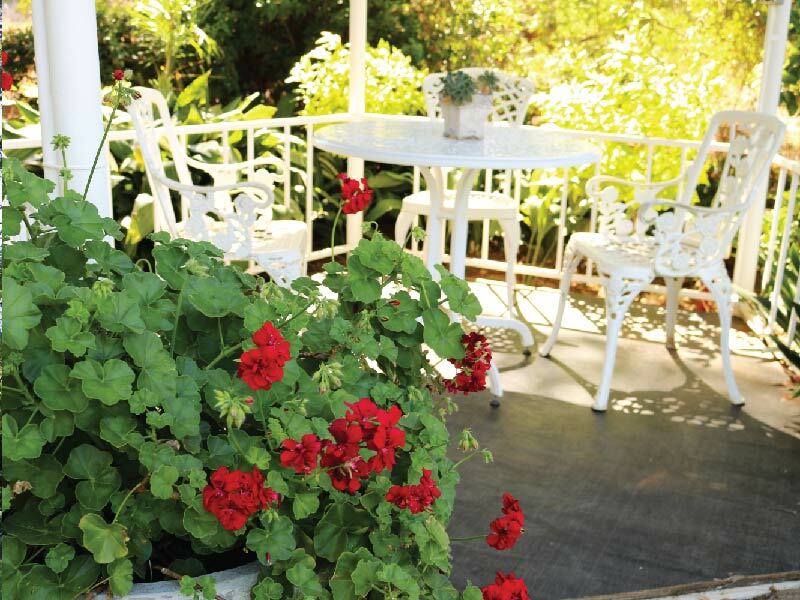 Choose your own basket from the deli and enjoy on Uncle Ben, their riverboat, as you cruise on the Breede River. It is an Olive farm with excellent products on the Nuy road. It consists out of a 16km route, which takes about 3 to 4 hours. 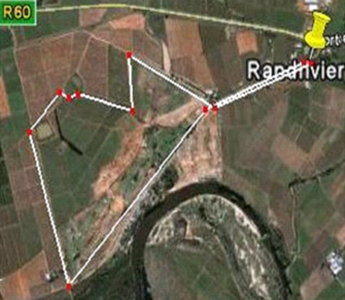 Fish eagle: At Van Loveren Wine Estate Takes about 3 hours. Vrolikheid Nature reserve: Bird hide. Short circle route and 19km hike. Dassieshoek: 1 or 2 day hikes. Overnight in hut in the mountain. 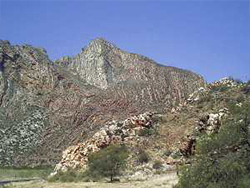 Boesmanskloof: Hike over mountains to rock pools and on to Greyton. Arangieskop: 2 day hike. Overnight in hut on the mountain. Appointments must be made for large groups. 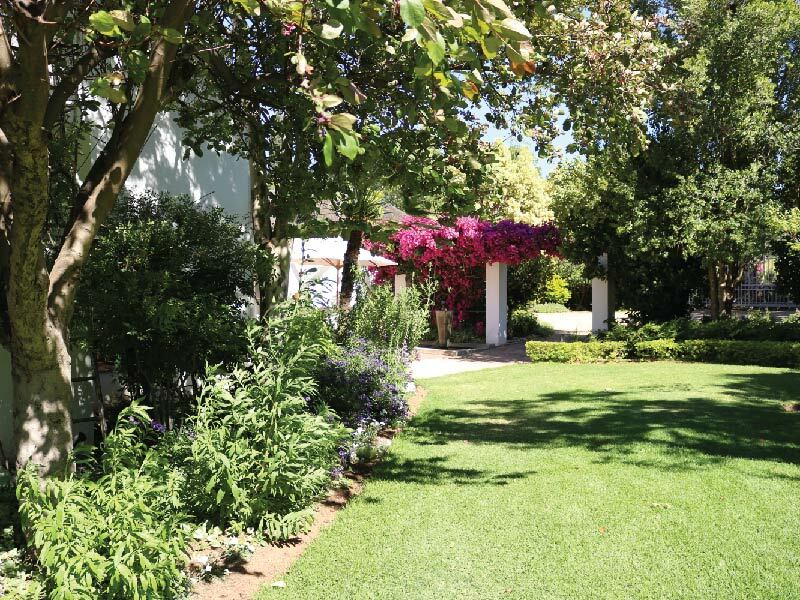 Bon Cap, Fraai Uitzicht and Robertson Winery are open on Sundays. 1st Sunday of the month Viljoensdrift, Graham Beck. Experience our beautiful restaurants, wine boutiques, art galleries and the friendly people of our region. This is for people who just want to stretch their legs and get a glimpse of what is happening on the farm. They walk past the pack shed & workshop, crossing the big irrigation canal that is feeding the valley up to Ashton. The route will take you through the vineyards, plum & peach orchards towards the 2 historic graveyards where ancestors of the Bruwer family are buried. On your way back to the main house you can visit the old still that has been restored. 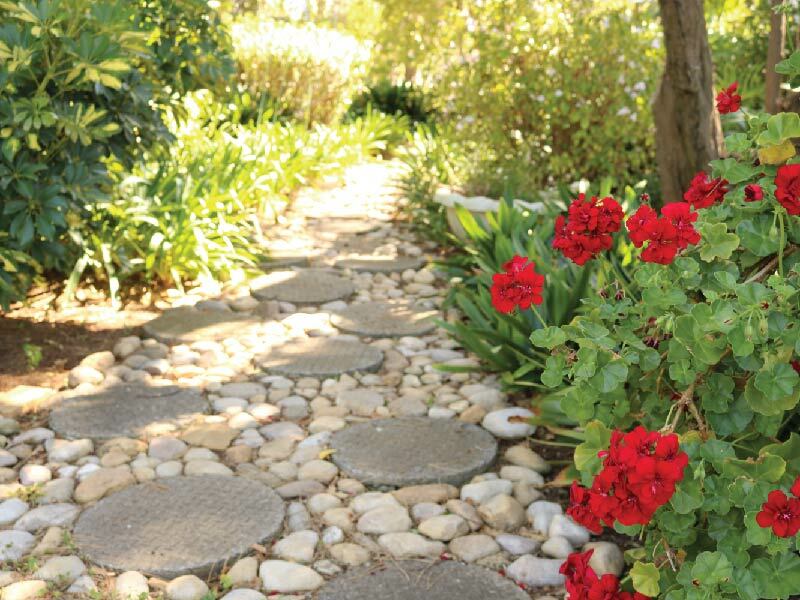 This route takes you past the grave yards alongside the canal through vineyard & orchards to a historic stone bridge over the canal on to where the canal goes into a siphon underneath the Willemnels river. 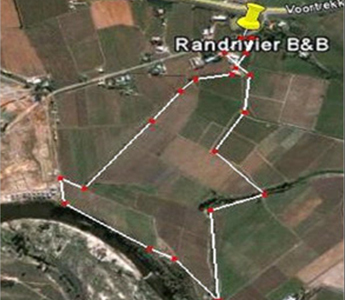 Then you will follow the Willemnelsriver for 1/2 km and go back with a loop through vineyards. You will enjoy the fresh air, birdlife, if you are lucky small buck or a hare on route. This hike takes you straight past the grave yard towards the Willemnels river. You will follow the stream till where it joins the Breede river. From there you will follow it upstream to the fence of the Silwerstrand estate and then you will follow another route back to the Guesthouse. 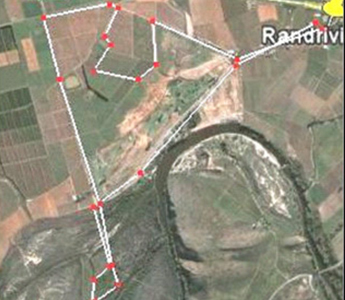 This route will take you over several neighbouring farms with the permission of the owners. 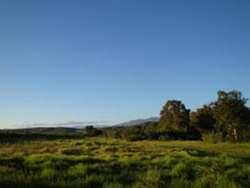 You will cross and be able to experience some of the best farm land in the area. To walk to town is a different experience than taking a hike on the farm. 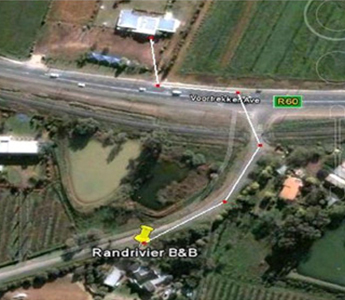 There is nice paved walking lane next to the main road with street lights from Randrivier all the way to town. If you want to get the exercise and meet the locals along the road, this hike/walk is a must. The route will take you into town via Voortrekker road past the Shell garage & shopping centre. You can then turn left into Paul Kruger Street towards the town centre. If you then take a right into Church street walk to Reitz Street and right again down to the Tourist office. 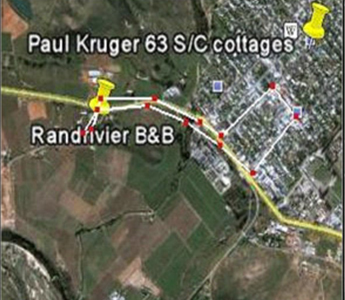 You can then follow Voortrekker road towards Randrivier. For the adventurous and people who would like to enjoy their wine and do not want to drive back after that, it is quite safe to walk in to town for dinner in the evening with street lights on the whole way. It also helps to burn some calories after a big meal. This route will take you down to the Golf course. Just before you cross the canal you turn right into the Trek path all along the fence to where it ends. Turn left in a farm road, again along the fence. The first road right to the dam. Around the dam to your left all along the irrigation furrow that supplies us with water from Brandvlei dam. Walk just passed the next dam anf turn left with the vineyards on your right and the golf estate on your left. 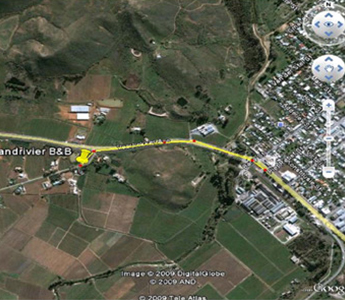 Proceed to a farm road and turn left passed the Silwerstrand camp site onto the main road back to Randrivier. This route is also nice for jogging and for cycling. This is for people that want to do the distance. The route will take you also around the Golf estate but with a longer route through farm land and then to the interesting Eiland section that takes you onto the Ram island. This section can also be done on its own if you drive your car to the entrance of the eiland, then park it there and then do the 2.5 km hike to the Ram island. This can also be done by joggers and cyclists. 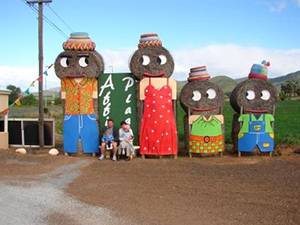 The Affi Plaas (meaning – from the farm) Farm stall is one of the most popular farm stalls in the Western Cape. It is open From Sunday to Friday from 07:00h to 18:00h. 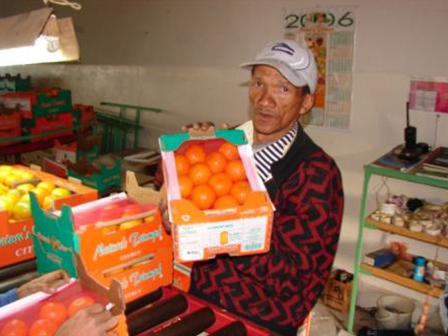 They have a huge range of fresh fruit, farm products, wine, and lots more. 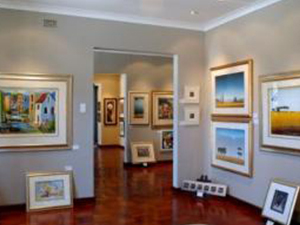 Well worth a visit while staying at Randrivier! Robertson is one of the most central towns in the western cape, 1.5-2 h drive in a160km range will take you to Cape town, Agulhas, Hermanus, Somerset West, Strand, Gordonsbay, Stellenbosch Wine lands, Tulbagh, Ceres, Ladismith, Riversdal, Witsand, Laingsburg, or Sutherland. 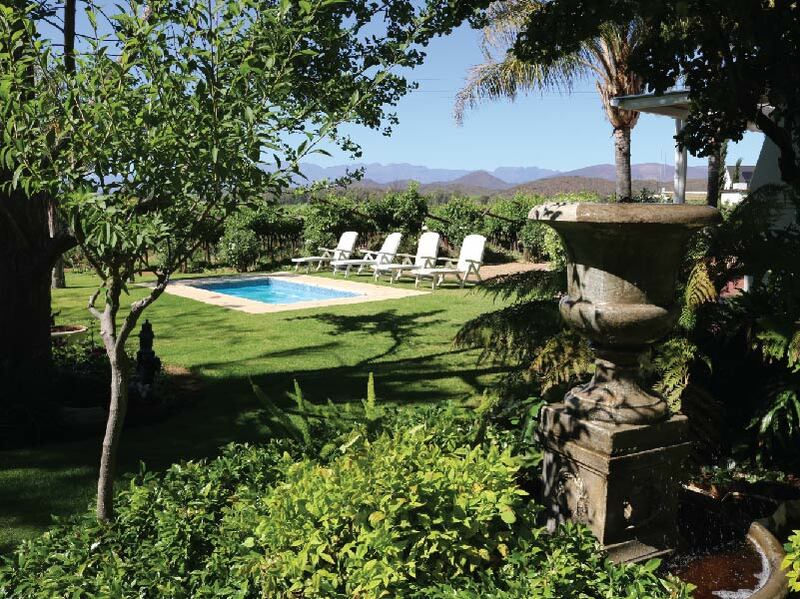 To stay in Robertson is very affordable and it is not a bad idea to make it your base for your visit to the Western Cape. On longer trips you can consider taking only an overnight bag. Day 1) Start your trip after breakfast to McGregor, drive through the town where time stood still, visit the art galleries, antique shops & coffee shops. 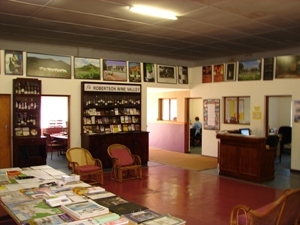 On your way back to Robertson visit the McGregor winery for wine tasting, the Donkey sanctuary or Vrolikheid nature reserve. 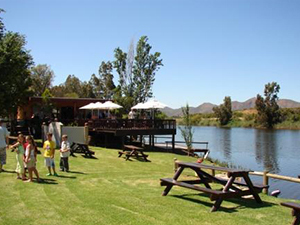 Back at Robertson take the wine route all along the Breede river to Bonnievale on your way visit several world famous wine farms for tasting, go on a boat trip on the Breëde river and have lunch at one of the venues. 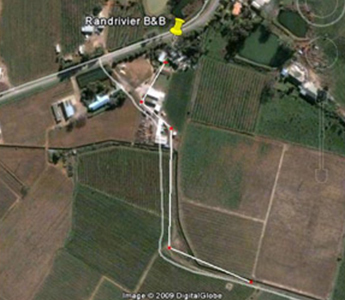 Drive into Bonnievale a beautiful farm village with several wine farms and a large cheese factory. On your way back to Robertson stop at the spots that you have missed before. 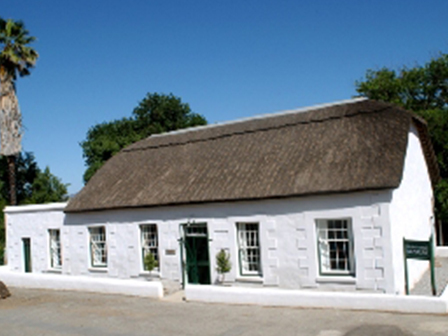 Day 2) Start your trip through Ashton to Swellendam( together with Tulbagh the 3rd oldest town in South Africa) with its beautiful historic buildings, museums and the Bontebok national park. From there drive through Buffeljagts, Zuurbraak – an old mission station in a beautiful setting in the shadow of the Langeberg mountains. From there through the historic Tradauws pass to Barrydale. Visit a coffee shop there and walk through the numerous art and antique shops. 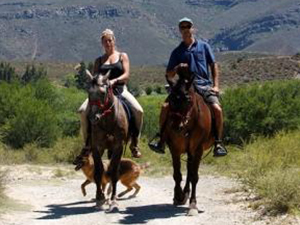 Follow the signs to Montagu with its beautiful mountain setting and hot water springs. Find your way back to Robertson through the Cogmans kloof pass with itsold English Fort from the Boer war times. Day 3) Make a early morning trip to Bredasdorp and visit the shipwreck museum. Then to Agulhas, visit the most southern tip of Africa and admire the scenic coastline. From there travel along the coastline towards Gansbay through several coastal hamlets. Gansbay is the centre of cage diving with the white sharks and also have a nice Harbour with a fishing industry. From there to Hermanus a very popular coastal town and world famous for Whale watching. From there through scenic country side settings via Villiersdorp back to Robertson. 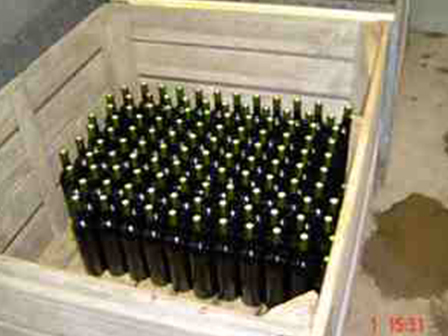 Day 4) On your way to Worcester you can visit a few Wineries for tasting or just to look around. 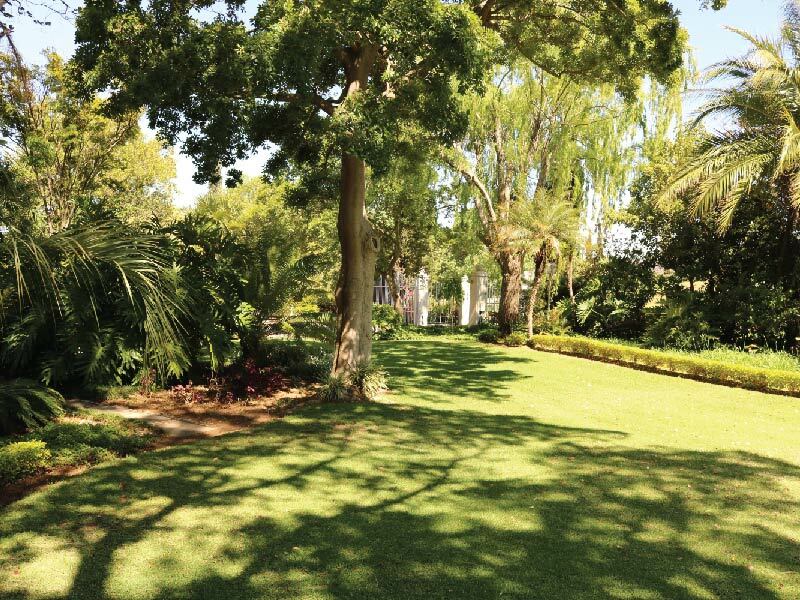 In Worcester, you can visit the biggest brandy distillery in Africa, the Kleinplasie agriculture museum and the wild flower gardens. 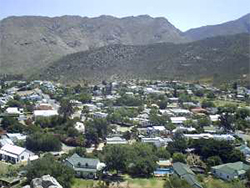 From there you can travel to Ceres, a beautiful town nestled in the Witzenberg mountains. Then to Tulbagh, an historic town with lots to see from yester year. 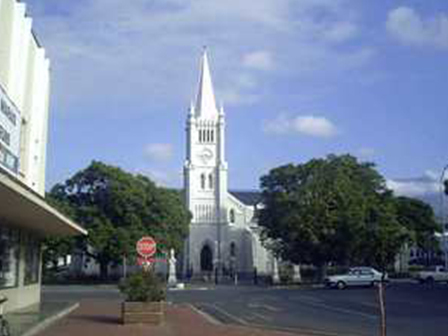 From Tulbagh to Wellington, the town where the South African poet Breyten Breytenbach was born and also where Dr Andrew Murray – famous church leader – was based. From there to Paarl where history was made in the developing of the Afrikaans language. You can also visit the Taal (Language) monument. 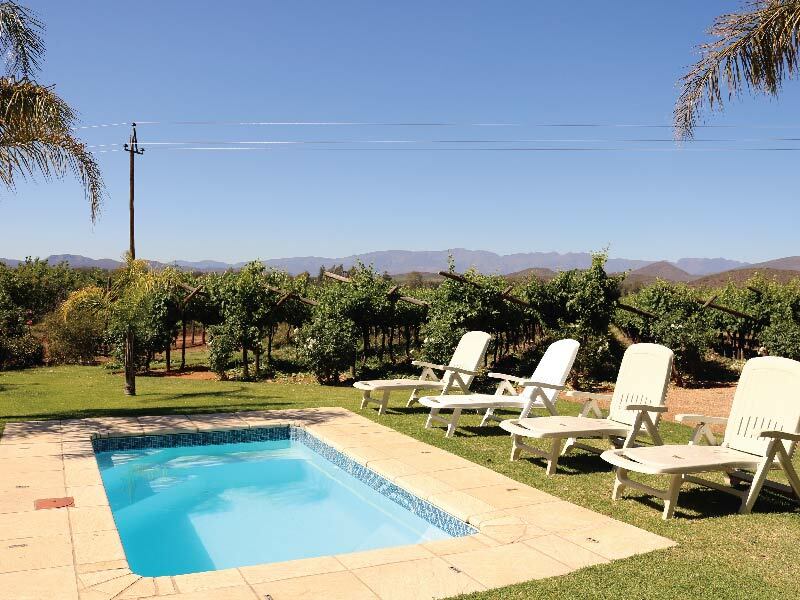 On your way back you can visit the Rawsonville area with all its wine farms, beautiful mountains and water streams. 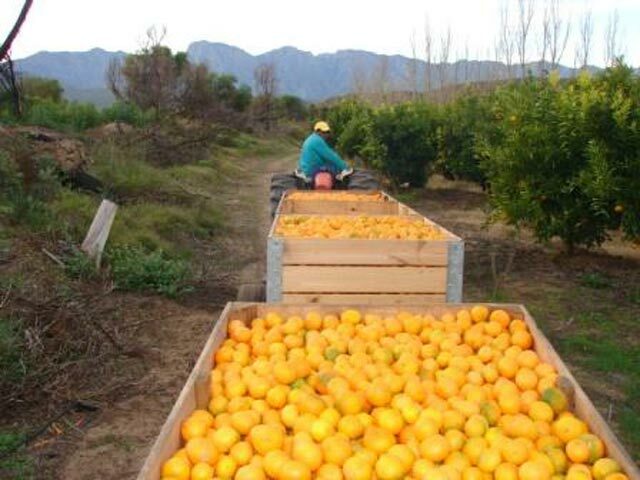 Day 5) You leave early for Villiersdorp – a lovely town in one of the main fruit growing areas. After looking around and getting the feeling of the town move on to the Theewaterskloof – dam the largest man made lake in the western Cape, supplying water to farmers down stream the Sonderend river and also through tunnel in the Drakenstein mountains to farmers down stream the Berg river and it also delivers water for the metro of Cape Town. From there you take the road over the Franschoek pass and stop at a viewpoint on top to absorb the scenic view over the Franschhoek valley with all its vineyards and fruit Orchards and lovely old cape Dutch buildings. This is an area full of history where the French Huguenots were settled in the 16th century. 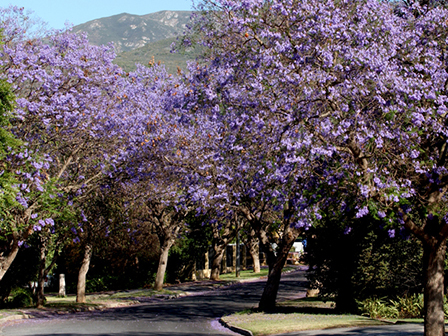 Follow the road down the pass into Franschhoek. There you can visit the Huguenot museum, lots of tourist shops and fine restaurants. 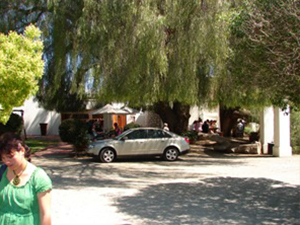 Also visit one of several historic wine farms for tasting or refreshments. Then you move on through historic Huguenot farms to Pniel – a small hamlet nestled in the mountains. Then on to Stellenbosch over the scenic Hellshoogte pass. Stellenbosch is the second oldest town in the country and its streets are lined with large old oak trees. There is also lots of history all over the place, buildings, university and wine farms. From there to Somerset West, Strand and drive all along the beach or have a dip in the ocean. 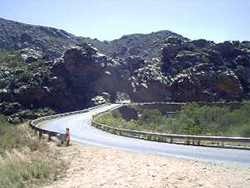 Then follow the N2 over Sir Lowry’s pass to Grabouw, to Villiersdorp and then to Robertson. The above mentioned is only a guide on what is possible and you will have to tailor your trip to your personal needs. We will help you and supply you with available info to plan your day. Beautiful Robertson. A must to visit of you want to experience beauty and great hospitality together with good food and wine. After more and more farms were started in the Breëde river area in the region that was known as “over het roodezandt”, the need for a church and school was growing. 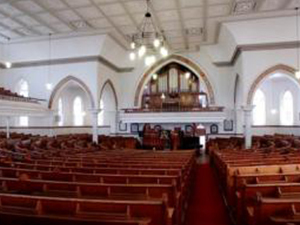 After using then van Zyls farm Over het Roodezandt for church gatherings for a while, the Dutch Reformed Church bought it and the town was founded in 1853 , Robertson was named after the Dutch Reformed Minister Dr William Robertson. 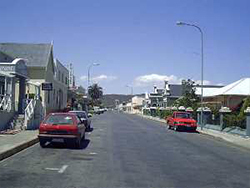 Robertson today is a prosperous town in a beautiful setting in the shadows of the Langeberg Mountains in the Breëderiver valley. 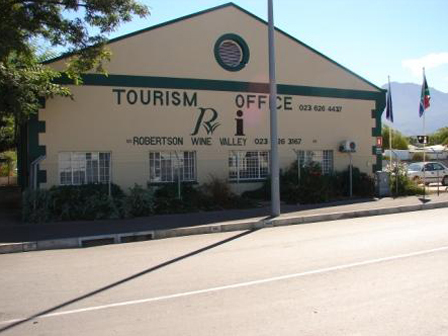 Robertson is the main town in the Robertson wine Valley with its numerous tourist attractions and neighbouring towns of McGregor, Ashton, Bonnievale and Montagu. It is central located and been use by tourists for the town to stay in while they explore the area in a 160 km radius. 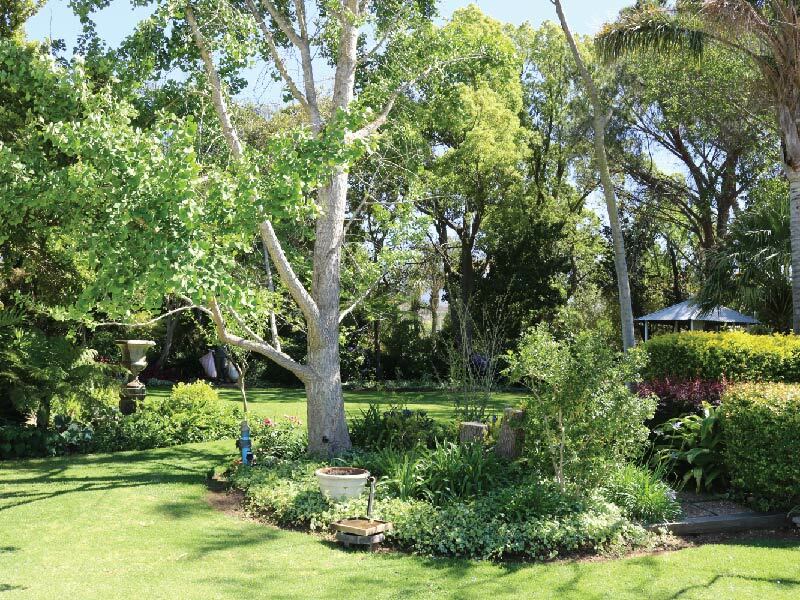 Robertson is a peaceful country town with a population of +-20,000 people with several schools, churches of all dominations and all the service you will need in the country side. 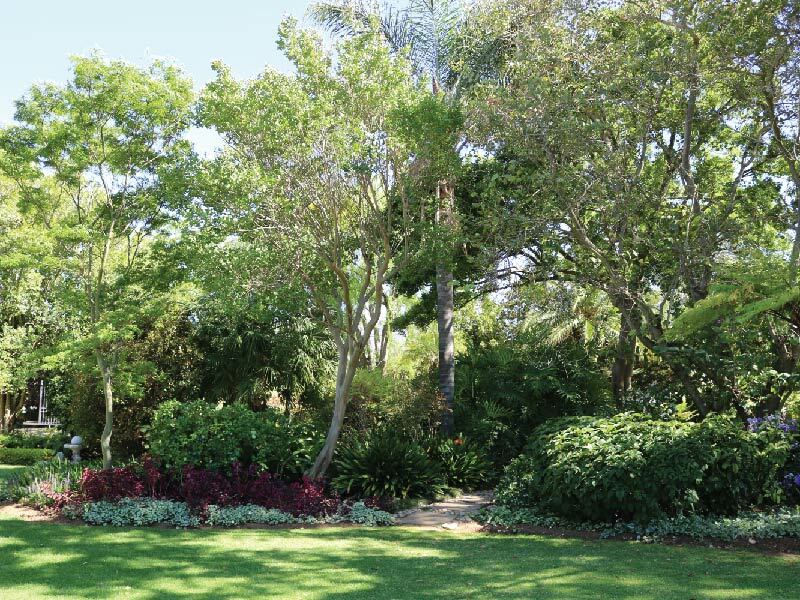 Robertson is on the famous R62 tourism road and experience a rapid growth in tourism with 50 accommodation establishments, 50 wine estates, lots of restaurants, art galleries, shops, 18 hole golf-links and numerous other attractions. The streets are wide and lined with lusty growing trees. All roads leading to and from Robertson are in good shape. The rural road in the valley are lined with cannas,roses and lovely trees. 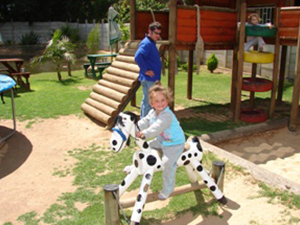 Robertsonians are warm & friendly country people and are looking forward to have you here. 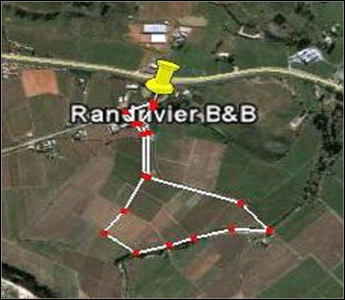 ©Randrivier Guesthouse All rights Reserved | Designed & Maintained by Breededesign.